Shop Knowledge center Crop care How does an iron chelate work? How does an iron chelate work? Chelates are organic elements that bind the iron like a claw, so that the iron remains available in the solution, thus available to the plant. A plant can only absorb nutrients that are dissolved in water. Fertilization of iron is always dosed in chelated form. This, because iron easily precipitates when in contact with other elements. This precipitation is prevented by adding iron to the solution through chelates. There are different types of iron chelates, all with their own characteristics. The strength of the chelate is depending heavily on the pH level of the solution, for example in the substrate mats or in the soil. Several chelates are present on the market to suit every pH level in the root environment. The stability of iron chelates is the priority here. If an iron chelate is not stable, it's not strong enough to hold on to the iron in the solution. At a pH level in which the chelate is not stable, the iron quickly precipitates, with the result that the plant isn't able to take in enough iron. 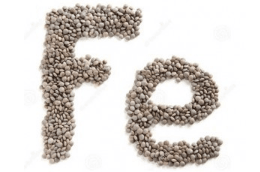 The iron thas has been precipitated due to an incorrect pH level has become a 3-worthy iron, meaning a Fe² has become a Fe³. The disconnection of the chelate Fe³ cannot be reversed, since it has oxidized (known as rust). Therefore, the selection of an appropriate chelate is of great importance. EDTA is the least strong chelate of all chelates on the market. EDTA iron chelates are mainly recommended for foliar fertilization, since they are not perceived stable enough to be added to a fertilizer tank. Besides EDTA, the HEDTA chelate has almost identical characteristics to the EDTA. DTPA chelates are the most used iron chelates. This because most cultivations remain a pH below 6.5. The iron DTPA is therefore stable and available to the crops. Two liquid DPTA iron chelates can be distinguished: 3% and 6%. The two differ in terms of sodium used in production. The 3% DTPA chelate is produced with a large amount of sodium, while the 6% variant is mainly produced with ammonium. In various cultivations, sodium keeps adding up in time and is very likely to cause problems. To prevent these problems from occurring, the Iron DTPA 6% is often recommended. The only disadvantage of this DTPA 6% is the slightly higher cost of production, resulting in a higher cost price. When the pH reaches a level around or above the 6.5, it is advisable to switch to the red iron, EDDHA (partly or completely). The EDDHA iron remains its stable to a pH level of over 10. EDDHA iron can be found on the market under several names. Even though, at first glance the characteristics may seem the same, the shape of the EDDHA chelate is extremely important. EDDHA chelates always consist out of a mixture of three different structures. The following figure gives an overview of the different shapes. 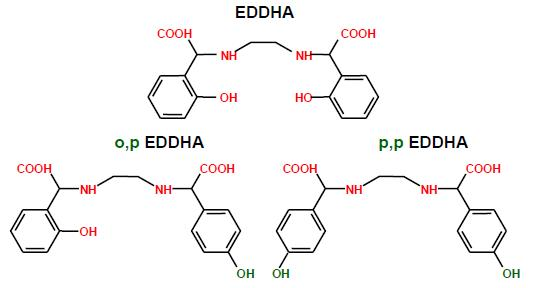 Of the different EDDHA structures shown above, the top one is most stable. It’s called an ortho-ortho EDDHA. The other two types are called ortho-para and para-para EDDHA. Since all types of red iron (EDDHA) on the market contain one of the above-mentioned structures, it’s important to select the product with the highest ortho-ortho level. Take product A, an EDDHA chelate with 6% iron chelate of which 4% is ortho-ortho. This simply means that we are giving 4% stable iron chelate. This does not mean that the remaining 2% is not available to the plant at all, however, this will precipitate quickly, and its produced fruits/ vegetables will be much lower. If we now would replace product A with product B, an EDDHA chelate with 6% iron chelate of which only 2% is ortho-ortho, it means that the remaining 4% of iron chelate is less stable and will therefore precipitate quickly. The number of fruits or vegetables harvested is therefore much lower. Simply put, you will need about twice as much of product B than you would need from product A to get the same amount of iron to the plants. In practice, product B will therefore be offered more cheaply than product A. Any questions about the functioning of chelates? - How to prevent fertilizers from precipitating in fertilizer tanks? 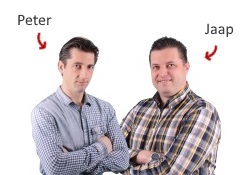 - How to prevent a shortage of trace elements?